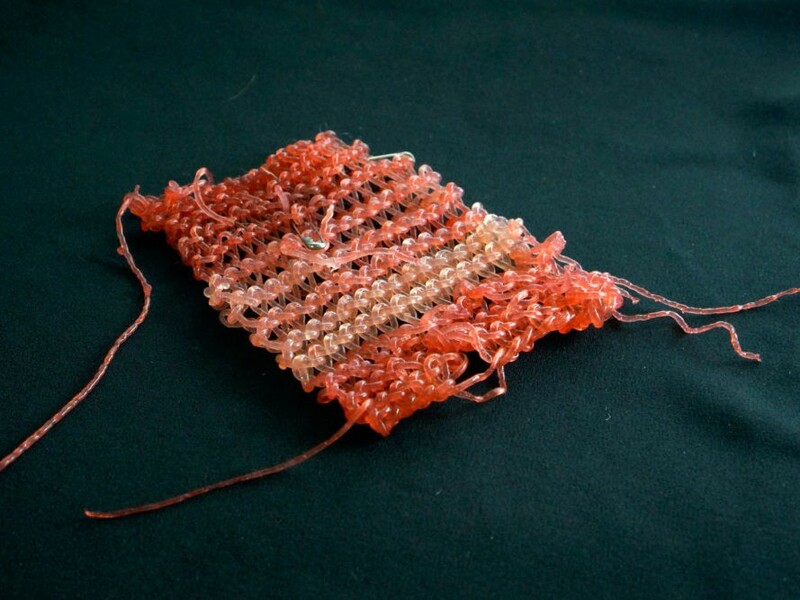 A group of students from New York City's Fashion Institute of Technology have developed a biologically derived filament that can be knit, whether by hand or machine, to create a new breed of textile. Composed of alginate, a polysaccharide found in the cell walls of brown algae, the material led the so-called "Bioesters" team to clinch first place at the Biodesign Summit at the Museum of Modern Art last month. Foodies might recognize the stuff. "The form of alginate we experimented with is sodium alginate," Tessa Callaghan, Gian Cui, Aleksandra Gosiewski, Aaron Nesser, Theanne Schiros, and Asta Skocir told Ecouterre. "It's used frequently in molecular gastronomy to create flavored caviar through a process called 'spherification.' It's also frequently used in the medical industry for wound dressing and impression making." But alginate is typically used in sheets, a form that doesn’t lend itself well to fashion designers. Deciding to change the form factor into something more familiar, the students used a syringe to extrude the alginate into calcium chloride, where it could cure into a structure that more closely resembled yarn. To the students’ surprise, the material was also remarkably elastic. An early version of the knitted filament stretched 70 percent beyond its original length. Likewise, a mesh version of the filament, churned out by a customized three-dimensional printer, stretched 50 percent. Biopolymers, particularly those extracted from low energy-consuming organisms, are key to creating a truly closed-loop economy for the fashion industry, the students say. Not only are the resulting textiles biodegradable but they can also serve as nutrients for future iterations. “The ultimate goal is to significantly reduce greenhouse-gas emissions and toxic waste created by textile productions,” they added. But alginate is typically used in sheets, a form that doesn't lend itself well to fashion designers. Deciding to change the form factor into something more familiar, the students used a syringe to extrude the alginate into calcium chloride, where it could cure into a structure that more closely resembled yarn. Further experimentation with various concentrations of chitosan, a polysaccharide obtained from fungi, and citric acid allowed the group to alter the properties of the filament, transforming it from "stiff and opaque to soft and transparent." To the students' surprise, the material was also remarkably elastic. An early version of the knitted filament stretched 70 percent beyond its original length. Likewise, a mesh version of the filament, churned out by a customized three-dimensional printer, stretched 50 percent. "We see significant improvements in sustainable energy production, but not a lot in sustainable textile and apparel production, considering it's the second-most polluting industry in the world," the Bioesters team said. "By realizing the true cost of textile and apparel production, we must apply both creative and logic thinking to solve this problem." "The ultimate goal is to significantly reduce greenhouse-gas emissions and toxic waste created by textile productions," they added.